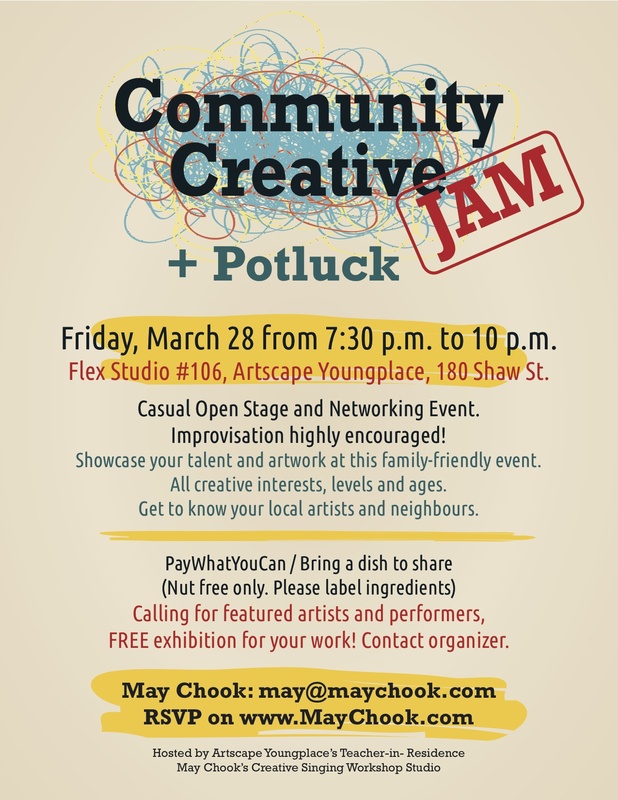 The Community Creative Jam is a family-friendly and casual networking event for all creative disciplines, ages and levels. Improvisation is highly encouraged! Community members and artists are welcome to watch, mingle and perform. Activities for children will be on the menu. The stage is open, play us a song or tell us a story. It is going to be a fun night! Admission is Pay-What-You-Can. Bring your talent along. More details about equipment available will be posted. This is also a mini potluck – bring a dish to share if you could (nut-free and please label ingredients). Food is a form of art. ARTISTS ALERT! We are looking for FEATURED ARTISTS and ORGANIZATIONS/COLLECTIVES to perform, table or exhibit work. ALL creative disciplines, the more the merrier! Please contact organizer. We are also looking for collaborators and sponsors (for instruments or food). Email us, let’s chat. Flyer designed by Alyssa Lai.